A weekly alert for followers of crime, mystery, and thriller fiction. 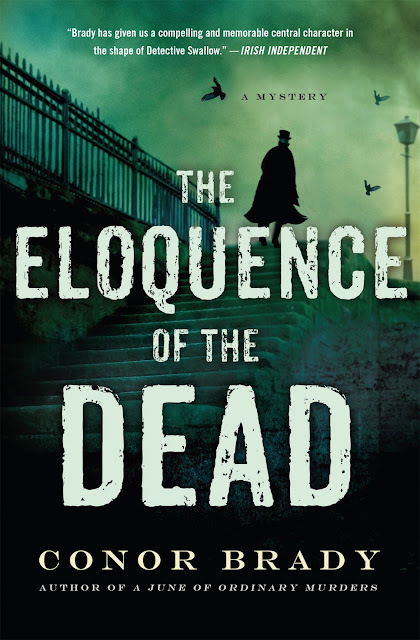 What better book to begin with on this St. Patrick’s Day than The Eloquence of the Dead (Minotaur), former Irish Times editor Conor Brady’s sequel to last year’s brilliant historical whodunit, A June of Ordinary Murders? Once more we are ushered into the company of Detective Sergeant Joe Swallow, a now 43-year-old physician trainee-turned-investigator with the Dublin Metropolitan Police, who—thanks to the habitual drunkenness of an otherwise useless superior—has inherited responsibility, in the fall of 1887, for getting to the bottom of the fatal attack on a tight-fisted, middle-aged pawnbroker, one Ambrose Pollock. Suspicion falls initially on Pollock’s younger sister, Phoebe, who had recently been exhibiting what for her were extraordinarily sociable behaviors. She has since disappeared, which—unless she was kidnapped by Pollock’s killer—seems to confirm her guilt. However, this case still presents too many questions, including how an undocumented cache of top-drawer household silver came to be secreted beneath the Pollocks’ shop. Meanwhile, another broker, Ephram Greenberg, is assaulted after having purchased a number of ancient coins from a mysterious young woman who was apparently ignorant of their worth. Is there a connection between these crimes? And could they be linked as well to “land reforms” in Ireland that have caused large estates to be purchased by the British government, then broken up and sold to tenant farmers in hopes of quashing Irish insurrection? How far can Swallow take his probe before it uncovers corruption that higher-ups will want kept quiet? Brady does much in this robustly plotted novel to flesh out Swallow’s character and frustrations, as well as the personalities of his fellow coppers. The author even gives his protagonist a new romantic interest, Greenberg’s artistic daughter, Katherine. He’s more successful yet in capturing the Victorian setting of his yarn, featuring details about how street-side gas lamps only slowly achieved their full luminescence, and mentioning that during the late-19th century—and as a safety precaution—passing patrolmen never saluted (and thereby identified) plainclothes detectives. Brady’s Joe Swallow series hasn’t yet disappointed. I am looking forward to the third installment, A Hunt in Winter, which is scheduled for release in Ireland this coming October, and—I hope—a U.S. debut soon after. UK critic-author Barry Forshaw long ago established himself as an authority on English-translated Nordic mysteries, producing the guide Nordic Noir in 2013, which he followed up a year later with Euro Noir. 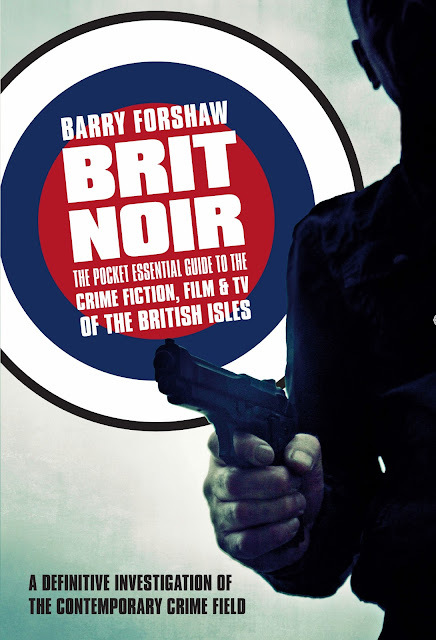 Now comes Brit Noir: The Pocket Essential Guide to the Crime Fiction, Film & TV of the British Isles (Oldcastle/Pocket Essentials). Drawing in part on research he’s done for previous books such as British Crime Writing and British Crime Film, Forshaw presents here a compact survey of modern mystery and thriller authors from England, Wales, Scotland, and Ireland. Not all of these wordsmiths produce what can unarguably be termed “noir” fiction, but they’ve nonetheless contributed significantly to crime genre—everyone from Mo Hayder, Robert Wilson, and Minette Walters to Dreda Say Mitchell, Andrew Taylor, Ken Bruen, and Lynda La Plante. Entries aren’t arranged alphabetically; nor do they cover the entirety of each author’s work. Instead, this book, like its predecessors, is designed as a connoisseur’s sampler, with Forshaw suggesting specific works by each writer that will expand your understanding of the field as a whole. A section at the end about UK films and TV shows is guaranteed to give you plenty of entertaining new ideas whenever your Netflix queue runs low. Next up for Forshaw: American Noir. Click here to see more of this season’s most-wanted books. Fiction,” by Janet Rudolph (Mystery Fanfare).